Computer Othello by Gabriel is a self-contained table top game with a 2" square LCD screen. The screen displays the game in progress and the score at the end; it will also display the score prior to making a move. The game can be played by one player against the computer or by two human opponents. We see little reason that two people would want to use this device to play since handling the pieces is part of the fun of playing Othello, however, the option is there if you want it. Computer Othello allows either you or the computer to go first, however, according to standard convention, the player who goes first is black. If you find yourself in a nasty predicament and want some help, you can switch sides with the computer for one turn, or as often as you wish. Indeed, by switching sides on every turn, you can watch the computer play against itself. This can be quite instructive, particularly at higher skill levels. The game offers eight skill levels, ranging from novice to expert. Jonathan Cerf, the reigning world champion, would have no trouble beating the game at Level 8, however, normal mortals will find plenty of challenge at lower skill levels. Entry of moves is simple; you just press a letter and number to define the row and column of your move. Computer Othello beeps acceptance of your move and flips the discs automatically. An illegal move causes a buzz and you must re-enter it. If you don't make a move within 4 1/2 minutes, the computer will make a warning sound. Pressing any key turns off the sound and resets the warning timer. Computer Othello requires four alkaline C-cells because of the high current drain. Unfortunately, it does not have provision for an AC adapter. 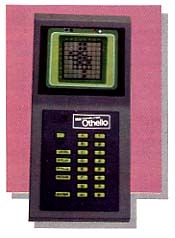 In summary, Computer Othello provides a skillful opponent any time of the day or night at any skill level you wish. This is a "must" game for Othello enthusiasts.